On January 3, 2014 (2 Shevat 5774) the world lost a most special gadol. My first meeting that I ever recall having with Reb Efraim zt”l took place when I was 13 years old. My grandparents, Mr. & Mrs. Azriel (Ike) and Gladys Eskenazi of blessed memory, lived in Memphis and my family would spend the summer there. Grandpa had a weekly standing chavrusa slot with Rav Efraim in addition to the many public and private classes that he attended. Grandpa took me in the car from his house on Ashbrier to 5556 Barfield, a whole two minute drive and told me, “I want you to meet Rav Efraim, my dear Rebbe (my grandfather was 14 years older than Rav Efraim but treated him with the deepest respect as a student before his master). He is a great talmid chachom and I told him that you study in yeshiva and asked if he can learn with you instead of me during my slot.” I didn’t have much time to react and I was quite nervous about the meeting. All of that fear melted away when Rebbetzin Miriam a”h opened the door and greeted me with a warm smile and delicious baked goods. My grandfather then escorted me into the Rav’s office where I met one of the sweetest, most caring and humble men I ever met in my life, who was smiling at me offering his hand in greeting. I knew at that moment that this was a person whom I wanted to get to know. Even though I was so young he gave me tremendous respect, asked me what I was learning pulling out a Gemara Bava Metzia upon my reply. He began to ask me questions and to give me words of approval and encouragement. When he saw that his questions were too hard for a young 13-year-old American boy (he held me to a high Israeli standard) he made them even easier and gave me a pinch on the cheek saying to my grandfather, “what a special young man who knows his learning so well.” He also made sure to share praises with me about how much my grandparents meant to him and the Memphis community. A few days later on Shabbos afternoon my grandfather told me he was going to shul to hear a Gemara shiur from Rav Efraim. I begged him to take me along even though I was the youngest person in the class by about 50 years. I sat right across from Rav Efraim and all I remember from that class are two things: 1) the smile on his face that radiated his love of Torah and 2) how he kept looking around the room and asking, “am I being clear, do you understand?” He even repeated something to make sure that I got it! That summer began my lifelong relationship with Rebbe, one which resulted in hundreds of shailos both written and orally, semicha, and hundreds of foundations in personal hadracha and guidance. After spending a few days with Rav Efraim in shul that summer I gathered the courage to ask him if he could learn with me for the rest of the time I was in Memphis. He graciously agreed telling me, “your grandfather already arranged it and I look forward!” He spent many hours teaching me Gemara Bava Metzia and convincing me that I was asking great questions. At the end of the summer he wrote me a glowing letter (which I still cherish to this day) to give to my principal and Rebbe back home. The feelings of warmth and love carried me from each summer visit to the next and when I went to E”Y to learn I began to fax him shailos and call on a regular basis. My grandfather helped him publish each volume of Rivevos Efraim and was thanked in many of the introductions as well as in an inscribed copy of each sefer some of which I have now inherited. I used to ask him questions about his sefer which brought him great pleasure to discuss. I tell people that if you want to know what a talmid is, open up the Igros Moshe and see how many questions Rav Efraim asked Rav Moshe Feinstein in his desire to learn from him; if you want to know what a rebbe is, open up a Rivevos Efraim and see how much of an expert in all fields of Torah Rav Efraim was and how much love and respect he afforded each of his talmidim. When my grandfather lost his mother he went to his rebbe to ask what to do in her memory. Rav Efraim knew that my grandfather deeply loved his mother and he knew that he could encourage my grandfather to take on a monumental learning project. Rav Efraim told him, “we will learn shisha sidrei mishna together and then make a big siyum in her honor.” My grandfather was taken by the idea and for the next seven years that’s exactly what they did! Rav Efraim made sure that my grandfather fully understood every single mishna. The siyum that they held became a most special milestone which my grandparents were very proud of. Rav Efraim was born in Eretz Yisrael in 1932 and utilized his strong Torah background and inquisitive mind to achieve greatness in Torah. Rav Efraim often shared with me and other talmidim as well as in print throughout his teshuvos (see every single introduction to each volume of Rivevos Efraim) his love and appreciation for his parents who taught him the derech of Torah. His father was from Brisk and instilled a great appreciation of learning that his 11 children carried in their hearts all their lives. Rav Efraim’s grandfather, Rav Yitzchok Greenblatt, supported the family from his business in America. In the early 50’s Rav Yitzchok hit hard times and he devised a plan whereby he could continue to support his son and grandchildren in E”Y. “Send Efraim to America, I will give him my job as the Rabbi in my shul and he will send you his salary. 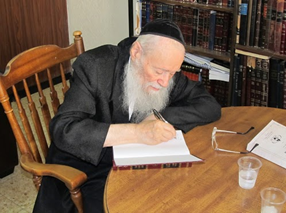 I will take care of all his needs here.” Rav Efraim told me that he was very serious about his learning at the time and also had an adventurous side willing to consider the move. His family lived in abject poverty and it seemed that he had to make the trip. He asked Rav Isser Zalman Meltzer what to do. Rav Isser Zalman told him, “go to America, you will make a huge impact with your success there and you will merit to return back to E”Y.” Rav Isser Zalman gave him semicha before the trip as well. Rav Shach and the Chazon Ish also blessed the trip. After much ordeal he arrived in NY and was accepted as Rav at 19 years old in his grandfather’s shul. He would lead all the davening, lain and give classes on Shabbos in Yiddish which they appreciated. During the day he learned by Rav Moshe Feinstein who was located very close by. He soaked up every shiur of his Rebbe and often escorted Rav Moshe whenever he had to travel locally or afar. After learning by Rav Moshe for a number of years and earning semicha, Rav Moshe told him to check out the Memphis community as they were seeking a bachur to help strengthen it and he felt that Rav Efraim would be the perfect fit. He loved seforim and he amassed a huge library which he used. I still remember the shelves in his home piled three rows deep and the sheds in the backyard which were accessed often. When he was learning something and needed a sefer he would pay top dollar no matter what it took to obtain that sefer. He told me that nowadays we are spoiled and can get hold of any sefer but back then you simply could not find sefarim such as the Pachad Yitzchok (by R’ Yitzchok Lamparti, 1679-1756) for less than $300 per volume. Rav Efraim was so unassuming. He didn’t demand anything from the community, he simply poured out his heart to teach and learn with anyone who wanted. He taught by example; this had the greatest impact. Everyone in the city loved him. Some appreciated his learning and some just knew him as the sweetest man with golden middos whom they respected and admired. His first language was Ivrit and Yiddish and although he understood English perfectly, it was not his first language in speaking. He pushed himself to communicate in English so that we would best understand him. He always wrote back to me in Hebrew because he felt he could best express himself that way but he encouraged me to write to him in English if I felt it was necessary for giving over my question. In my experience with Rav Efraim his love and warmth were so strong that I always saw him as eloquent and clear in his communication despite an occasional language difference. When I brought my wife to meet Rav Efraim for the first time she was so impressed by his middos and sweetness. She felt like all of the Torah and learning that he accomplished was evident from the way he treated people with sensitivity and respect. He gave us a very memorable and heartfelt beracha during that visit. When Rebbe was mesader kiddushin by a close friend of mine’s wedding he had the presence of mind to say to the Kallah, “take your time drinking the wine I don’t want any of it to spill on your dress.” He was so thoughtful and always shared his care. Rebbe was not a baal mofes but on the way to that wedding there was a terrible storm and the plane was almost diverted if not for Rebbe telling the flight attendant that everything would be safe because he needed to land in NY for the wedding that he was officiating. This was before 9-11 and Rav Efraim was invited to the cockpit to talk with the captain. The captain was so moved by the Rabbi’s presence that he decided to land (it had been a tossup regarding safety). Rebbe told me that from his experience in the field of community development and as a rav the starting point is taking care of your family, making sure that your wife is happy and ensuring that you spend time with your own family being there for them and teaching them Torah. Rebbe’s actions spoke volumes about his fulfillment of this goal and together with the Rebbetzin they built a beautiful family together while caring for their community as well. Rav Efraim and his wife taught all the bar mitzva students. (Yes, that’s right, you read that correctly.) Rav Efraim would record the parsha and his wife would listen to the students, correct them and use the recordings to show them how it should sound. She was an expert in the field. Rav Efraim was often unable to walk far (due to health restrictions) to a distant shul where some Bar Mitzvos were held and his wife went as the family representative. Rav Efraim was the official baal korei of Anshei Sefard Beth El Emeth Congregation. When I was 14 and came for the summer Rav Efraim asked me if I wanted to lain on Shabbos, I told him that I would do half of Parshas Vaeshchanan. Shabbos morning as I entered the shul I realized that with all of my vacationing I had forgotten to prepare the laining. I sheepishly went over to Rav Efraim at about 9:30am that morning and told him that I forgot to study my part. He just smiled at me and said, “it’s okay I’ve lained this before, I will take care of it, let me know if you want to try again next week, you did a great job on Monday and Thursday with your laining.” He then got up and lained it with fluency. I was blown away by his calm demeanor even thinking back to this story. When Rav Moshe came to visit the Memphis community he was not happy with the small mechitza in the shul. Rav Efraim later wrote a letter asking Rav Moshe how to fix it according to the best halachic practice. Rav Moshe’s response is the famous teshuva which discusses mechitza requirements. Rav Efraim tried his best to put up a mechitza according to halacha and with sensitivity to the feelings of the shul members. I once asked Rav Efraim why he sat in the front left corner of the shul right under the mechitza. He explained that he chose his seat because it was the best spot according to halacha in relation to the mechitza. Rav Efraim knew when to speak up and how to best deal with the community needs. He had a great sense of humor and would laugh along with the community members. They loved and adored him. When he announced that he was considering moving back to Eretz Yisrael the community put up a big fight to convince him to stay. He would not sway and finally when they realized that it was happening they made him a grand honorary farewell banquet. When he got up to speak his opening words were, “you finally got rid of me!” The crowd erupted in laughter. He then continued to talk about all that he had gained from the community and how much he would miss them. Everyone cried from their dear rebbe’s departing words and were inspired to carry on his work. In 2002, a few years before moving to E”Y, the Rebbezin was tragically hit by a car and later passed away due to her injuries. I can attest, as many others who knew him as well, that Rebbe was never the same. His emunah was strong but his health was deeply affected. He continued to write, teach and publish as he had promised her (see his introduction to Rivevos Efraim Al HaTorah 2) but his health, which had always been weak, was deeply affected. Rebbe once told me that his wife took such care of him that he did not even know where his silverware and dishes were and which were milchig and fleishig. “Since she passed away I only use plastic because she took care of me and everything in the house.” I knew the Rebbetzin from my times at the house, she took no other delight in life than to see her husband learn and teach Torah and she strived to remove any boundary that got in the way. I understood the accuracy of what Rebbe was describing and it also testified to his amazing hasmadah which she made possible. I find it fascinating that Rebbe always thanked and blessed his parents, wife, children, uncles, rabbeim, and siblings by name in each introduction. Rebbe exuded love and wanted to share and express this to the world. Rebbe always mentioned how much hakaras hatov he had for my grandfather and all that he did for him in publishing his seforim and as a friend. I compiled a list of the many times that my grandfather’s name appears in the seforim asking thoughtful questions. Rebbe’s way was to draw in his talmidim and the baal habatim to learning and to celebrate their questions by quoting them by name in his sefer. I have never seen any other responsa sefer that quotes so many community members and young children. Many of those kids grew up to be great marbitzei Torah because of Rebbe’s encouragement and warmth. Rebbe lost a daughter Shaina Chaya on Hosanah Rabba 5718/1957. He dedicated many things in her honor and mentioned her in all his introductions. When Rebbe’s wife passed away after being tragically hit by a car while on her morning walk, he never questioned Hashem. He went forward with strength and resolve with his full energy. When sad events happened Rebbe offered love, support and chizuk. Rebbe once told me that Rav Moshe was very careful to be sandak for each one of his grandchildren. Even though he held that one should not be a sandik for the same family more than one time, in this case he felt it was important that none of his grandchildren should grow up saying that he is better than the others because his grandfather was only his sandak. Rebbe pointed out the sensitivity and how careful Rav Moshe was. Rebbe told me that he had a long manuscript where he wrote about his experiences with Rav Moshe both in halacha and in stories that happened. He said it was in one of his many storage sheds and that if he came across it he would let me know. Unfortunately, I never saw it but in Rivevos Efraim hundreds of Rav Moshe’s psakim are quoted. I asked Rebbe if someone is allowed to exit the house through a window instead of going thru the door. He thought and said that he always heard that it is better not to but he has no source. He then said, Rav Moshe Feinstein’s sukkah was located in such a place that Rav Moshe had to climb out a window to get to it, so obviously one is allowed to and that is the halacha! In Rebbe’s introduction to Rivevos Efraim Volume 1 and 2 he writes that he davens to Hashem that he should be able to publish other works which he has completed: On Chumash, Megillos, Moadim, Shas, Rambam, Sugyos, Kelalim, Shu”t in Daled Chelkei Shulchan Aruch, On Maharik and Mahari Viel, Hagadah shel Pesach (in 2010 Rebbe mentioned this one to me and that he was proofreading it), Peninim Yekarim, Mareh Makom for Rashi on Tanach, Zeraim Kodshim and Taharos. Rebbe wrote Rivevos Efraim on Kabalah 3n manuscript form as well. There were so many shialos that I asked him and he would tell me, look in Rivevos Efraim in a certain place, I already poskined there on this topic and all the points that you just said are discussed there. Rebbe’s seforim hold haskamos from Rav Moshe Feinstein who encourages him to continue to print, Rav Shach, Rav Yitzchok Yaakov Weiss, Rav Mordechia Gifter, Rav Yaakov Yiztchok Ruderman, Rav Yaakov Betzalel Zolty, Rav Shlomo Zalman Aurbach, the Tzitz Eliezer and many more. They all wrote about his great yediyos, hasmada and middos. He was mevatel daas to others in a most dignified way. He quoted his dear friends: Rav Ovadia Yosef, Rav Binyamin Zilber, Rav Chaim Kanievsky, Rav Yitzchok Sternhill throughout the sefarim. I once asked Rebbe a complex shaila. He wrote to me two possible answers and he chose the first one as the halacha. I had written a letter to Rav Chaim Kanievsky and included that shiala long before I spoke with Rav Efraim. When Rav Chaim responded he poskined like the second approach that Rebbe has mentioned. When I told Reb Efraim what Rav Chaim had said he replied, “if that is the case then I retract my opinion and I am batel to his daas, we were childhood friends and I love him and respect him deeply.” Rav Efraim did not stand on ceremony. He followed halacha to a tee and he was passionate about truth, he had no problem retracting and being batel to others. Rav Ovadia and Rav Efraim had many halachic arguments quoted throughout both of their seforim and in most of the cases Rav Efraim was mevatel daas to Rav Ovadia unless it involved defending the opinion of his dear Rebbe Rav Moshe, then he couldn’t bow to anyone else because Rav Moshe had already decided! He was a great man of peace. When Rav Shach and Rav Ovadia Yosef disagreed very strongly about many political issues in E”Y it caused Rav Efraim great pain. He was a very close talmid of Rav Shach and a deeply connected friend of Rav Ovadia. He tried to make peace between them using only his connection to both and the stature of who he was. When Rav Shach told him that he would not relent and to end the discussion, Rav Efraim withdrew and never mentioned it again as he saw it as counterproductive. I once asked Rebbe if he opened his hand when he said the words in ahsrei of “poseiach es yadecha, Hashem opens His hand…” He told me that he does open it and has no source as to why, it is just something he saw many great people do. He then added, “your grandfather used to do this as well.” I replied, “Rebbe, that’s no proof, he followed everything that you did!” He laughed as he knew it was true. Rav Efraim was always encouraging us to learn, write and share. He loved to hear from all his talmidim and he would tell all of us that if we put in the effort we can achieve greatness in Torah. Rav Efraim often stressed to me that you don’t need to be a genius to succeed in Torah, you just need dedication. He said the same thing about shalom bayis when someone asked him for a beracha. “Shalom bayis is not something that you can get a beracha for, it’s something that you must work towards.” It’s all in the effort. Rebbe always made time to meet with people who wanted to talk with him. He gave you his full attention and showered you with love and concern. At the same time Rebbe was very regimented and I must admit that I never was able to count how many chavrusos and learning slots he had as there were so many. Rebbe once commented to me that a certain person came to his house to shmooz and told him straight out that he just wanted to kill time. Rebbe said that although I give everyone time to talk and reminisce that is for the purpose of developing a relationship and producing something productive from the interaction, in this case I told him that I was unavailable because B”H I have better things to do! Since Rebbe passed away I have been devastated by our loss. I only find some comfort as I review Sefer Rivevos Efraim and recall our discussions in Torah and derech chaim. Here are a few that come to mind which speak volumes about Rebbe. One Shabbos the baal tefillah got sick in the middle of chazaras hashatz before saying the words “modim.” Rav Efraim immediately ran up to the bima to make sure he was okay and the person motioned for Rav Efraim to take over. Rav Efraim began from that exact spot with “modim: until the end. This seems to be against halacha because we know that the first and last three berachos of shemoneh esrei are one unit and one must start again from retzei. Rav Efraim actually asks this question on himself in Rivevos Efraim and he explains with the Beir Halacha which tells you something very great about Rebbe. The Beir Halacha says: If you take over for the chazan during the first or last three berachos you start from the beginning, this is only true if you weren’t listening to chazaras hashatz, but if you were following every word until that point, then you take over from exactly where he left off because you are simply continuing for him and not taking over as a new unit!” That means that Rebbe had followed every word until that point with great concentration. Why were the ten makos split up with 7 in Parsha Vaera and 3 in Bo? The Jews were redeemed from Egypt in the merit of their following their great forefathers. Parshas Vaera begins the redemption and opens with “Vaera el Avraham, Yitzchok v’Yaakov” to signify this fact. The 3 plagues in Bo represent the three Avos. Arbeh (locust) hints to the promise that Hashem gave to Avraham, “Arbeh es zarecha, I will increase your children like the sand.” Chosech (darkness) hints to Yitzchok who suffered from blindness. Bechoros (death of firstborns) refers to Yaakov who bought the firstborn rite from Eisav. This is exactly why the very parsha which these three are in is called Bo (Beis Alef) which is the letters Av, fathers. The Jews left Egypt in the merit of their forefathers and for following in their ways (see Rivevos Efraim II:1). Rebbe continues to ask, I always wondered why was the Beis HaMikdash built on the place of the akiada where Yitzchok was bound and not on Har Sinai where the holy Torah was given? The answer provides a huge lesson and perspective. On Har HaMoriah Avraham and Yitzchok did a great action of avodas Hashem showing they were willing to do any action for Hashem. On Sinai, the Jews just accepted the Torah thru passively listening but there was no action! Therefore the place chosen for the Beis HaMikdash teaches us that Hashem wants to see our action and dedication to him. More so, the Mikdash was in the land of Binyomin because he was the only one of the 12 shevatim who did not hurt Yaakov by being involved with the sale of Yosef. Thus, we see that greatness is built upon sensitivity and caring for others. Rebbe’s life was an example of connection to the forefathers, avoda and love and care for others. At my grandfather’s levaya in 2004 Rebbe spoke about how when a best friend moves to Eretz Yisrael we all cry because we will miss him. But the truth is that your friend has gone to a much better place. It is normal to cry, but we are also happy for the great achievement that he has accomplished. So too, when someone passes from this world, we are left grieving a friend who moved to Eretz Yisrael, i.e., who went up to Heaven to be by the Throne of Glory. We miss this person on earth but we are happy to know that he is in the greatest place in the world. When Rebbe left America to Eretz Yisrael we greatly missed him, but we still came to visit him often. Now that Rebbe has gone to the olam haemes this parable, given in his own words is most apropos. We deeply miss Rebbe, but we know that his neshama is tzrurah bzror hachaim and has reached its greatest level. May we learn from his life, learn from his seforim and carry on his legacy of hasmada, dikduk behalacha and love for every Jew. Yhi zichro baruch.